To Cite: Mirzashahi B, Najafi A, Mansouri P, Farzan M. A New Modified Open Posterior Approach for the Fixation of Posterior Cruciate Ligament Tibial Avulsion Fractures, Trauma Mon. 2017 ; 22(5):e36958. doi: 10.5812/traumamon.36958. Background: The most efficient treatment of posterior cruciate ligament (PCL) tears and the consequences of untreated PCL injuries is still debatable. Objectives: The aim of this study was to assess the outcomes of a modified technique for the fixation of tibial posterior cruciate ligament (PCL) avulsion fractures. Methods: From January 2009 to March 2012, 45 cases of PCL tibial avulsion fractures were managed through a modified technique. We used a lag screw and washer in the open posterior approach for our patients. Assessment of the range of motion of the knee was initiated on the day after the surgery. Clinical stability, range of motion of the knee, strength of the gastrocnemius muscle, radiographic investigation, and the quality of life of each of our patients was analyzed upon the last follow-up evaluation. Results: The mean of the overall musculoskeletal functional assessment (MFA) scores was 15 (range 3 - 35). At the last follow-up evaluation, all of the fractures in our patients were unified, and all of their knees were stable upon physical examination. Preoperative assessments showed that the mean Lysholm score for 15 knees was 62 ± 8 with a range of 50 - 75, which changed to 92 ± 7 with a range of 75 - 101 after the operation; our analysis showed that this difference was significant (P < 0.05). At the first-year follow-up evaluation, differences of less than 10 mm in thigh circumference were observed in 42 (93%) patients when comparing their injured to healthy knee. Conclusions: The management of tibial PCL avulsion fractures with the use of a cancellous lag screw and a washer by means of a modified open posterior approach leads to satisfactory clinical, radiographic, and functional results, and reduces operation time and blood loss. The most efficient treatment of posterior cruciate ligament (PCL) tears and the consequence of untreated PCL injuries is still being debated. The necessity of surgical management of displaced tibial PCL avulsions is considered to be less provocative, and several studies have reported the use of different techniques, such as open and arthroscopic approaches (1-7). We recently managed PCL tibial avulsion fractures by using a modified open posterior technique. This approach provides direct visualization of the surgical site, differentiation and protection of the neurovascular components of the knee, and anatomic fixation, leading to compressive fracture site reduction through the use of a lag screw. 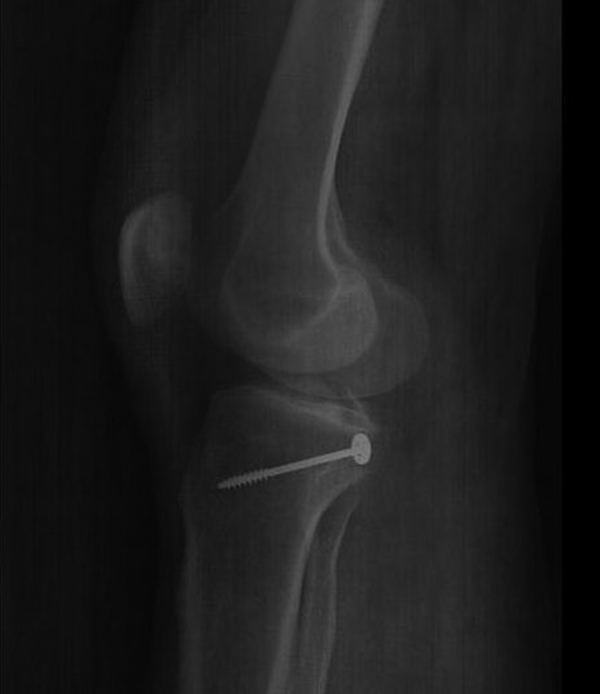 Furthermore, the stable fixation obtained via this approach allows for the immediate initiation of postoperative assessment of the knee’s range of motion. In some patients with PCL avulsion, appropriate sight of the anatomy and an open-reduction approach are essential because minimally-invasive management is not suitable in all cases. The aim of this study was to describe our direct open approach and to report our clinical and functional outcomes supporting this approach for treatment of tibial PCL avulsion fractures. We hypothesized that at the end of the follow-up period, our patients would have satisfactory functional outcomes (shown by low musculoskeletal functional assessment [MFA] scores and Lysholm Knee Scores); also, according to posterior draw testing, it was predicted that they would have stable knees, no gastrocnemius muscle weakness, and no significant loss of range of motion when comparing the treated knee to the contralateral knee. Furthermore, fracture union was expected. We believed that this minimally invasive approach would not lead to significant blood loss nor neurovascular damage during the minimal operation time. From January 2009 to March 2012, there were 45 cases of PCL tibial avulsion fractures that were referred to our hospital and managed through our modified approach. All of these avulsion fractures were affirmed by means of a senior surgeon’s physical examination and imaging investigations. All of the patients were examined via the anterior drawer, posterior drawer, and Lachman tests to assess for cruciate ligament injuries, along with varus and valgus stress tests at both 30 degree flexion and extension in order to evaluate collateral ligament competency. To determine the insufficiency of the posterolateral corner, external rotation recurvatum and dial tests were conducted. Magnetic resonance imaging (MRI) was performed before the operation in order to assess for concomitant bony, capsular, or ligamentous injuries if the clinical tests were not decisive. Finally, for more accurate examination, each knee was carefully assessed under anesthesia in the surgical room. Informed consent was obtained from all of the patients. When the patient was in the prone position, a г-shaped incision was made with the transverse portion 2 cm below the knee flexion crease and the vertical portion over the medial head of gastrocnemius muscle. A tourniquet was used in all of our cases. After finding the lesser saphenous vein crossing the wound over the deep fascia, this fascia was incised along the lines of the skin incision. Additionally, the medial sural cutaneous nerve was found and protected. Both the lesser saphenous vein and the medial sural cutaneous nerve were used as guides to the space between the lateral and medial heads of the gastrocnemius muscle. Then, the medial head was split bluntly by the surgeon’s finger. In the next step, the exposure was advanced deeply, with due care of the popliteal vein, artery, and tibial nerve. As an important advantage of this approach, there is no need for exploration of the neurovascular components because of their being saved by half of the medial head of gastrocnemius muscle (Figure 1). Afterwards, the underlying oblique popliteal ligament and posterior capsule were vertically incised, if required. Finally, the posterior cruciate ligament avulsion could be identified. First, the bony base of the avulsion was carefully debrided. After successful exposure, the bony portion was pulled down to its right site and fixed with a temporary K-wire. After that, a fluoroscope was used to confirm the appropriate positioning. Next, the fragment was stabilized with a partially-threaded washer and cancellous screw (Synthes, USA). The screw, with a size of 4 to 6.5 mm, was selected based on the size of the avulsed portion (Figure 2). After fixation, a fluoroscope was used to recheck the position; if considered to be satisfactory, the incision was repaired. Deep fascia closure over the gastrocnemius muscle was performed via size 0 vicryl suturing. The transverse portion of this fascial incision was difficult to close because of tissue friability, and was commonly left open; the skin was then closed with nylon suturing. After that, the tourniquet was deflated, and we checked the distal lower limb neurovascular components. As a considerable advantage of this modified technique, there was minimal blood loss, so we never placed a drain. In comparison with the original technique, the skin incision of our technique was smaller and contained much less muscle splitting, and so there was less than 20 cc of bleeding (less than half of one gauze was used for blood cleaning during the operations). A preoperative radiograph, CT scan, and radiograph two weeks after the operation of one of our patients (31-year-old male) treated via the modified open posterior technique is displayed in Figures 3, 4, and 5. After the surgery, hinged knee braces were used on all of our patients. Passive range of motion of the operated knee was initiated at 0 to 30 degrees, and advanced as far possible on the first day after surgery. Also, patients were given permission to bear weight if they could tolerate it with the hinged brace in the extension position, and they were able to come out of it for further range of motion under the direction of a physical therapist. The average duration of hospital admission for the isolated PCL avulsion fractures was three days. Patients were advised to participate in the postoperative follow-up program with physiotherapy three times a week in order to achieve wider range of motion, increased mobility, and quadricep strengthening. For six weeks, they had to avoid active hamstring exercises. As part of our routine, patients were evaluated clinically at two weeks, and both radiographically and clinically at six weeks, three months, six months, and one year. Clinical evaluation for each visit (excluding the two-week postoperative examination) included examination of the posterior drawer, anterior drawer, and Lachman tests to assess for cruciate injury, as well as assessments of valgus and varus stress at 30 degrees and in extension to evaluate the collateral ligaments. To determine the insufficiency of the posterolateral corner, external rotation recurvatum and dial tests were conducted. 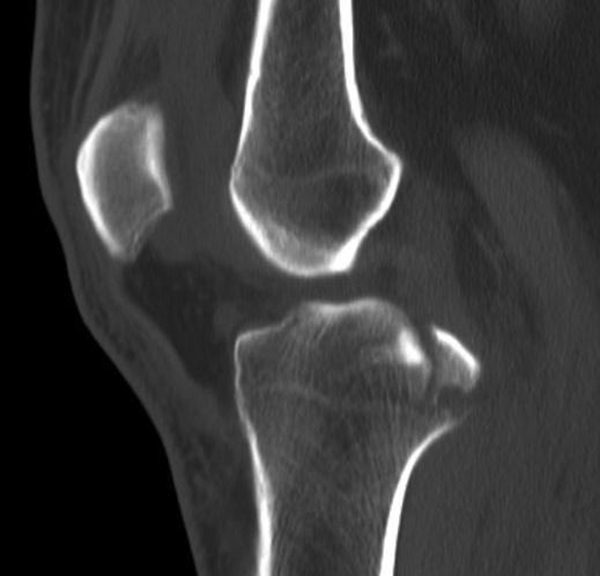 Radiographic examinations included anteroposterior and lateral radiographs of the knee. Overall patients at three months had stable knees in clinical examinations and showed radiographic signs of union, and after that, they were permitted to walk without their braces. Progressive closed kinetic chain strength training and continued motion exercises were started after about ten to twelve weeks. The initiation of heavy labor, pivoting, or cutting exercises was limited until six to nine months after the operation in order to achieve satisfactory range of motion, strength, and proprioceptive skills. Each contacted patient returned for one additional clinical visit in order to fill out a questionnaire along with a careful physical examination and radiographic imaging. The operated knee was then compared with the healthy knee. Measurements of the range of motion of each patient’s knee were performed by means of an accurate goniometer while the patient was in a supine position. The PCL was assessed using the posterior draw test and graded as grade I, II, or III (8); heel raises were conducted via a single leg stance. The clinical and radiological evaluations were conducted at each visit by the senior surgeon. The last follow-up examination was conducted by the same surgeon for all patients. First-year follow-up visits included clinical and radiological exams, musculoskeletal function assessment (MFA) scoring, Lysholm Knee Scoring (to document subjective symptoms), and thigh muscle atrophy evaluation. Atrophy of the thigh muscle was defined in terms of a smaller thigh circumference of the injured knee in comparison to that of the healthy knee at a position 10 cm proximal to the superior pole of the patella. The Cybex 340 Dynamometer (Cybex, New York, NY) was used before the operation and at each follow-up visit afterwards to detect postoperative residual thigh muscle deficits in the injured and healthy knees. Maximum flexion and extension torques were measured isokinetically at 180 degrees/sec. The side-to-side ratio (maximum muscle torque of the involved side/peak muscle torque of the contralateral knee × 100) at peak muscle torque was applied as the indicative marker for thigh muscle strength. The data were entered and analyzed using the statistical package for social sciences (SPSS version 18). P-values of less than 0.05 were considered as statistically significant. The quantitative data were expressed as mean ± standard deviation (SD) or median along with the interquartile range (IQR); for the qualitative data, frequency was used. Forty-five patients were followed up on for at least one year after the surgery. The mean age of our patients was 31 years (range 18 - 54). Seven of them were female and 38 were male. (Table 1). Forty PCL avulsion fractures occurred in motorcycle car accidents, and five were the results of falls. All of these patients usually had multiple traumas and additional injuries. Concomitant ipsilateral fractures were managed through open reduction and internal fixation prior to the PCL avulsion fracture operations. Our patients were operated on within eight days of their trauma, with the mean of three days. The mean operating time was 10 ± 6 minutes. The average follow-up period was 21 months (range 14 - 32) (Table 1). Radiographic investigation at the final postoperative visit demonstrated complete healing without dislocation of the fractured portions in all patients. None of our patients complained of major implant-related complications, and the implants were not removed. The average of the overall MFA scores was 15 (range 3 - 35). The average of the Injury Severity Scale (ISS) scores was 17 (range 6 - 45). Flexion, extension, and heel raise differences of more than two degrees after eight repetitions were not found in any patient (with P-values of 0.14, 0.34, and 0.39, respectively). No patient had posterior draw examinations with PCL laxity. All of the patients’ one-year postoperative radiographic investigations showed union at the fracture site. The Lysholm knee score was assessed to analyze the subjective symptoms. The mean Lysholm score for 15 knees before the operation was 62 ± 8 (range 50 - 75); the mean Lysholm score after the operations was 92 ± 7 (range 75 - 101). Our analyses showed that there were significant differences in the Lysholm scores before and after the operations (P < .05). After at least one year, 23 of 15 patients (51%) showed excellent outcomes at the follow up, and 15 patients (33%) showed good outcomes. Of the remaining patients, seven (14%) reported fair outcomes. No patient had a poor outcome. No neurovascular complications were detected in any of the patients included in our study. At the first-year follow-up evaluation, differences of less than 10 mm in thigh circumference in 42 (93%) patients were observed between their injured and healthy knees. Only one of our patients showed a difference of more than 10 mm. A Cybex study demonstrated that 36 (80%) patients experienced recovery of extensor muscle strength in the injured knee that was 90% or more of the healthy knee’s strength; nine (20%) patients recovered 80 to 90% of their normal knee strength. Moreover, 39 (87%) patients experienced recovery of flexor muscle strength in the operated knee that was 90% or more of the healthy contralateral knee strength, and six (13%) recovered 80 to 90% of their normal knee strength. However, there were significant differences in the extensor strength ratios, thigh girth measurements, and flexor strength ratios between the preoperative and postoperative conditions at a minimum of a one-year follow up evaluation. The modified technique described in our study is similar to the classic open posterior technique first introduced by Abbott, Trickey, and others (8). Here we describe a direct posterior approach via splitting the medial head of the gastrocnemius muscle, which requires no identification and/or manipulation of the tibial nerve, artery, and vein. Also, this technique reduces operation time and does not lead to any neurovascular damage during surgery. Nevertheless, the previously outlined methods generally recommend division of the medial head of the gastrocnemius muscle to improve exposure of the PCL avulsion fracture, which may cause weakness of the muscle and could increase complications during the operation. In our study, acceptable exposure of the posterior capsule and PCL avulsion fracture was achieved for all of our patients. All patients were followed up for 14 to 32 months, and reported good functional strength of their plantar flexors compared with the conditions of their contralateral knees. It is worth mentioning that the exposure attained by means of the modified technique enhances the placement of the lag screw of suitable size perpendicular to the plane of the PCL avulsion pathology. We believe that this fixation method leads to more acceptable stability of the site of the fracture, and allows patients to start moving instantly after the operation. Most of the authors who have explained the functional outcomes of open fixation of PCL avulsion fractures recommend cast immobilization for at least a six-week period (8-10); furthermore, knee stiffness has also been reported as an important complication of this method. the operation according to a study with five patients (11). Similarly, it is our opinion that range of motion may be improved with the use of a hinge brace for the knee and continuous passive motion in comparison with cast immobilization, but no study has compared the two methods on similar patients. Stable fixation is essential for postoperative management, and we believe that this is difficult to achieve via other fixation methods. All of our patients were equipped with hinged knee braces and advised to begin range-of-motion exercises in the hospital. This did not have an undesirable effect on the fixation stability, as all patients had Grade I or II posterior draw test results, and union without extra radiographic displacement or failure in the hardware was reported in all patients. Our results indicate that, after this procedure, patients commonly do well. In the other studies evaluating open fixation of PCL avulsions, the outcomes have not applied a confirmed functional assessment tool like the MFA score (12, 13). This is a questionnaire with one hundred health status items proposed to evaluate the self-perceived psychological, physical, and social well-being of the patients (with the range of scores falling between 0 to 100). Studies showed that this scoring system has good reliability and validity (12, 13). The average total MFA score at the final follow-up was 16 for our patients, compared with an average total MFA score of nine in the general population (14). Early range of motion was advised to take place under the supervision of a physical therapist; in addition, continuous passive motion was to start on the first day after the operation. The difficulties of this approach originate from the fact that the operation’s necessary position for patients is in either a lateral or prone position; nevertheless, the associated injuries require that patients be in a supine position for operation, and so the patient will need to change positions, which also requires reprepping and redraping. Another common open technique for PCL avulsion fixation is the posteromedial approach of Burks and Schaffe (1). This dissection applies to the interval between the semimembranosus tendon and the medial gastrocnemius muscle. The medial gastrocnemius is retracted laterally and provides protection to the popliteal artery and vein and the tibial nerve in order to allow for exposure of the posteromedial joint capsule. This approach evades dissection of the neurovascular structures in the popliteal fossa, as well as the modified open posterior technique that required the patient to be in the prone position. However, we believe that it is difficult to achieve suitable exposure of the PCL and capsule because the mass of tissue being retracted makes it hard to fix a screw perpendicular to the fracture site, and this consequently leads to less stable fixation. 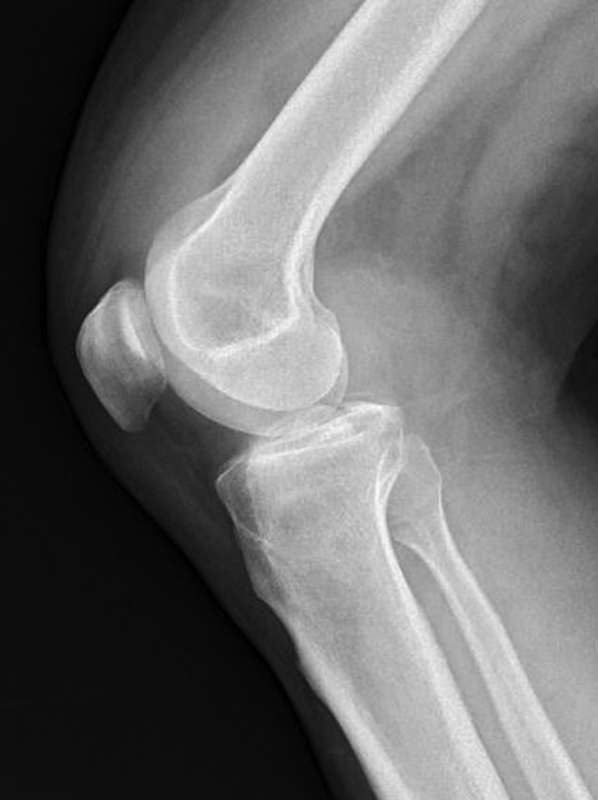 Along with open approaches, other techniques for the treatment of PCL avulsion injuries have also been reported that use arthroscopy. The fixation of large PCL avulsion fractures has succeeded via all arthroscopic or arthroscopic-assisted K-wire or cannulated screw fixation methods (6, 14-17), and arthroscopic approaches by means of fiberwire or suture fixation for smaller fragments have also been described (3, 4, 7). These techniques evade the requirement of direct dissection in the popliteal fossa, easing the fixation of smaller fragments in contrast to approaches performed with a lag screw technique. However, arthroscopic approaches are accompanied by a steep learning curve (7), and do not completely remove the risk of neurovascular injury; therefore, they may not be suitable for all patients with PCL avulsion fractures. Furthermore, arthroscopy of the damaged knee may be contraindicated in a subgroup of these patients because of severe soft-tissue injury. In addition, visualization may be difficult, or an impending compartment syndrome may start following an arthroscopic approach. No significant differences were found in MFA scores, range of motion, or number of heel raise repetitions between patients who followed up at less than two years compared with patients with longer follow-up durations. The MFA score is not a scoring system specifically for knee function, though, and is only a patient self-assessment of overall well-being. Still, it appears as though the management of displaced large PCL avulsion fractures with placement of a cancellous lag screw with a suitable size and washer by means of the modified open posterior approach leads to satisfactory clinical, radiographic, and functional results, and reduces operation time and blood loss. By using this technique, the gastrocnemius muscle does not need to be taken down. We believe that taking down this muscle may lead to increased morbidity during this surgery. Early postoperative rehabilitation protocols under the supervision of a physical therapist along with functional hinge knee bracing instead of cast immobilization is important in order to prevent arthrofibrosis. At 14 to 32 months postoperatively, patients experienced excellent functional outcomes, had stable knees based on posterior draw testing, did not complain about weakness of the gastrocnemius muscle or major range-of-motion deficits, and had union of their fracture without significant muscle atrophy. Authors’ Contribution: Surgical technique design, final edit, and revision, Babak Mirzashahi; study design, writing, and surgical technique design, Arvin Najafi; study design and writing, Pejman Mansouri; surgical technique design, final edit, and revision, Mahmoud Farzan. Funding/Support: There is no financial support to declare.